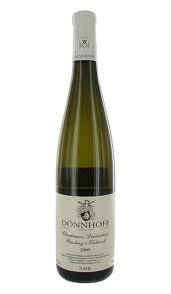 Overview: So if you haven’t guessed already this is a German wine, a Riesling to be exact. Kabinett is a style of making Riesling that basically means off-dry and is traditionally as dry as a German Riesling will get though there has been a push for producers to break with tradition and start making a drier style of Riesling as the popularity for sweeter wines has dropped substantially over the past few years. German Rieslings and the Kabinett style in particular ooze balance without the need to go as dry as our Clare Valley of Eden Valley Rieslings; the reason being is the interplay of sugar and acid. Acid is ever present in wine but like sugar it needs to be balanced, for instance you would not sit down and eat an entire lemon, unless you’re into self inflicted flagellation, why? Because it’s far too acidic but you would sit down and eat an orange because here we have a fruit that has sugar to balance the acid. The exact same applies for wine. A lot of people are put off from Germanic Riesling because of the influx of the cheap, sweet wines twenty years ago but believe me Kabinett style Riesling is one of the best styles of Riesling you can drink, especially with food that is a touch spicy. Tasting Note: A delicate, lemon colour. On the nose there is lanolin and orange blossom. The palate is softly constructed by flavours of citrus, orange sherbet, sandalwood and green apple peel and is supported by a fine, linear acid. Final say: Don’t let sweet scare you off, some of the best wines in the world are sweet or off dry, just know that there are few producers who seem set on destroying the reputation of good sweet wine. As I said, a chicken stir fry with a bit of chilli is a perfect match for this wine. You can pick this up for around $45 a bottle so treat yourself. Score: 17.5 Freakin’ Awesome (88 out of 100). All of the information above has come from my own brain and books; Wikipedia was not, at any stage consulted.